What do we actually know about attention in lectures? Studies suggest that learners attention, after a 2-3 minute settling down period at the very start, can be held for about 15-20 minutes Johnstone and Percival studied students with 12 lecturers in over 90 lectures. They spent 2-3 mins settling down, 10-18 minutes first lapses in attention after 10-18 minutes, then progressively shorter attention periods, dropping to 3-4 minutes towards end. A later study, by Burns, matched student summaries with lecture content and found exactly the same thing , "As the lecture proceeded attention spans became shorter and often fell to three or four minutes towards the end of a standard lecture." Highest recall was at the start with a fall off after 15-20 minutes. You would think that the solution to this problem would be no lectures, at least shorter lectures or even the recording of lectures for future attention at your own pace. But no, the one long lecture remains the mainstay of almost every educational institution and conference. This is akin to transport by horse, herbal medicine or astronomy by binoculars. They all work to a degree, but are hopelessly limited. Do you have access to the source papers? With these relatively old references (1976 and 1985 respectively) is it is hard to find them on-line. You need access to a physical university library. I would really like to know what the subject matter was, how the lecturers were selected and trained, how they defined "lecture" etc. I absolutely agree that in my experience 15-20 minutes is a key period for most lectures - although that doesn't meant the lesson has to stop. I have always tried to design instructor led sessions so there is some change of activity and chance to consolidate material at least that often. It is an interesting subject. How come we can only concentrate on a lecture for 20 minutes but have no problem concentrating on a James Bond film or even Melvyn Bragg on the radio for much longer? I recently complained to someone in the MoD about the low value of hour long lectures and he countered that briefings before going out on patrol in Afghanistan or Iraq are essentially lectures and can take much longer than an hour. There is no loss of attention because their lives depend on it. The point about movies is interesting - but they depend upon 'suspension of disbelief' a state that largely prevents reflection and learning. Radio also uses switch techiques in to maintain iterest - different speakers etc. It is certainly the case that lectures can maintain iterest beyod these avearged out figures. However, give teh low level of presentatio skills and the general lack of interest by academics in doing anything about this problem, meas the problems will remain. This is swimming against the tide. Far better to be radical, and scrap, shorten, record or use better dowloaded lectures. 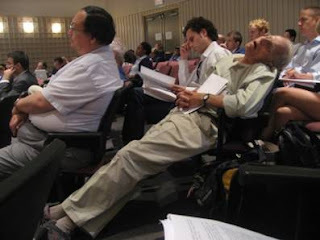 Iterestigli the FAA in the US have applied a strict 20 minute rule on lectures, as they regard long lectures as too dangerous! Bryer 1995, Fam Med. 1995 Jun;27(6):379-82. The purpose of this study was to compare the learning of family practice residents after lectures of differing lengths (either 20 or 50 minutes' duration). Immediate and delayed recall were measured by written quizzes administered at the conclusion of each lecture and 2 weeks later. METHODS: A total of 390 quizzes, 220 immediate and 170 delayed, were completed by residents from all three year groups attending didactic lectures as part of the regular training program curriculum at Naval Hospital Jacksonville. The completed quizzes were divided almost equally between 20- and 50-minute lectures. RESULTS: No significant difference was found when the Student's t test was used to compare the quiz scores following the contrasting lecture lengths at either the immediate post-lecture period (P = .294) or 2 weeks later (P = .5443). CONCLUSION: This study shows that a 20-minute lecture was equal to the classic 50-minute lecture in terms of information retained by residents. If future studies confirm this study's findings, medical educators will need to reevaluate the length of lectures to improve efficiency of teaching. Kia ora Donald - You mentioned "switch techniques" used by radio. It is also a technique that I've used in the classroom - a trick introduced to me by a forward thinking teacher-training-college lecturer. Fortunately I found that this worked early in my classroom teaching career. The New Zealand TV show 20/20 owes a lot of its success to the three slots that it offers in one hour with convenient commercial breaks in between fact-packed well produced items - a popular format for current affairs TV programmes and the like. So the lecturer's adjustment to an hour-long lecture is simple: split it into three varied 15 - 20 minute slots with short breaks in between. Surely this reasonable change to the lecturing style cannot be beyond an academic to fathom. Thanks for the references. My problem wasn't identifying the journal where they were written but getting hold of the journal - which in every case I could not find on-line. I think it is vital to read the originals of all research papers - not necessarily the whole paper but the key elements. Reports, press releases, reviews etc can be deceptive. Attention during lectures: Beyond ten minutes. Wilson, K. Horne J. Teaching of Psychology, Volume 34, Issue 2 June 2007 , pages 85 - 89. No doubt their conclusions can and will be disputed. But this adds to my growing belief that most research into learning, while valuable, is tentative and highly dependent on the context of the trial. It needs to be interpreted in the light of experience and common sense.